What to imagine! For example that "Moses was born on 8th February 1534 BC as the son of the Egyptian queen Hatshepsut, conceived by 'hieros gamos', and was in this way heir to the Egyptian throne". Mad? Certainly not, when we have read Ove von Spaeth's work about "Assassinating Moses", which is going to comprise five volumes, the first of which has just been published. Very convincingly the work claims that the situation is so according to historical sources - comprising not only the Old Testament writings, which are religious cult text, but also the Rabbinical Writings written 1000 years before the later form of the Old Testament as readings of the Moses texts. Moreover, those historical writings which are not cult texts, were also written considerably long time before our version of the Old Testament. When we hear the name Moses, we bring to our mind the little child in the boat among the rushes where Pharaoh's daughter finds him and connecting him as her own. However, many parallels to this phenomenon exist in the history of religions, concerning a king at an early stage when being a baby came floating to the country to which he should be a king. Where he comes from is not told. Think of the Danish legend about King Skjold (King Sheaf). One may wonder why Pharaoh's daughter went down to the Nile bank for a bath. She did so only in connection with religious cult ceremonies; and "Hieros gamos" was another special cultic ritual. The Old Testament Contradicting Itself? "Hieros gamos" (the sacred wedding) is the cultic act where the god begets earthly children of man. Many in the profession of Antiquity studies have a humoristic view on all the god-children Zeus has produced. However, this is the world of myths. More concrete we find the Roman emperors all of which up to Constantine the Great was the "sol invictus." The interaction between a wealthy ruler and the religious world of conception of the gods has always has been vital to the governmental power. It is no coincidence that Danish Queen Margrethe II also is the head of the Danish church. Ove von Spaeth has an accurate description of how the "hieros gamos" action. In the temple of the main god there was a special, royal chamber where this action would take place. The king had then dressed up as the god he was representing. The whole operation took place as a certain religious cult drama by which the queen conceived. When the royal son was born, it took three months before the queen again appeared in public, and it happened in connection with taking a cleansing bath in the Nile. The god-son arrived when sailing in a boat, an ark - just as Moses did, according to the Books of Moses. In the Old Testament is also stated that Moses was the son of a Hebrew, a Jew - it fits poorly that Moses as the Israelites' greatest prophet marrying a non-Jewish woman. It would be a contradiction of a Jewish prophet and the legislator which has just pointed out that the Jews were God's chosen people and were to turn their backs to the "pagan world". Does the Old Testament contradict itself, or what? Time and time again we are here confronted with religion-historical facts - sheding new light on Moses. In Ove von Spaeth's work is Moses a historical figure, not a mythical figure as we have learned at the university. Also, the biblical texts of Moses are not a merger of three different traditions, but originally one man's work. The fact that God has three different names in these texts: Yahweh, Adonai and Elohim, the author does not consider of great importance, "dear child has many names." I am somewhat unsure as to Ove von Spaeth's work. Certainly an attempt to place Moses into a historical context that makes sense. The fact that Moses was born to be a pharaoh - as the son of Egypt's only female pharaoh - but because of a palace coup then having to flee to Sinai and instead to become the Jews' first and greatest prophet of all, is a fantastic claim making up with the 3,500 years of Jewish and 2,000-year-old Christian tradition. But make your own judgment - at least you are learning a lot about ancient Egyptian and Jewish history and religion. Immensely well-written work with an inner excitement keeping the reader having a great experience. Should we make a negative comment about the book, it must be that there is also some old scientific literature from around the turn of the last century, in some cases the author's theories are also partly based on this. There may seem too few references to the present research in the Old Testament. But what is contained in the next four volumes? Ove von Spaeth: "The Suppressed Record - Assassinating Moses", cultural literature of C.A. Reitzel Publishers, 1999, 238 pages, illustr. The Suppressed Record - Moses' Unknown Egyptian Background: What makes the tale believable is the extent to which Ove von Spaeth has been able to assimilate a vast amount of information from a wide variety of sources, utilising research into Hebrew, Egyptian and other contemporary language documents. By RICHARD M. STERN, Dr.rer.Nat. Ove von Spaeth in his literary debut has created a highly original and yet, at least to the non-expert, believable story of the life of Moses and of his times. The period covered in this first of five planned volumes ranges from Moses' celestial (and biological) conception and birth to the then reigning queen Hatshepsut as "Son of Pharaoh's Daughter", through the famous episode in the bulrushes, to his crowning, at the age of three, as heir apparent and coming Pharaoh of Egypt. The book ends with an introduction to the next volume (which will deal with Moses as a young man) giving hints as to the reason for his banishment and his supposed flight from court intrigue and a "false" accusation of manslaughter, to live with his father-in-law (who, according to von Spaeth, is probably his biological father) Jethro in the desert. This is a detective story based on a great deal of circumstantial evidence but the case could just ring true. But even if this version of a controversial subject is fiction, it is interesting fiction. I truly enjoyed my second straight-through reading of this short story (told in less than 150 pages) because von Spaeth's glimpse of history, arrived at after a half-lifetime of research into primary and secondary sources, results from his combining this unique collection of information to create a logical framework for a series of lifelike characters. I have just returned from a series of travels where I visited Isis' temple at Philæ near Aswan and marvelled at the images of the goddess suckling her son Horus (a drawing of which is the front paper illustration while a colour image of a Horus hieroglyphic is on the cover), walked unknowingly past the spot near the massive temple at Karnak where the basket with the infant Moses presumably was found in the little basin at the then edge of the Nile (shown in detailed illustration in the text), climbed a bit of what perhaps is the Mt. Sinai of the Bible and then viewed the possible descendant of the burning bush and Moses' well in the Monastery of St. Catherina, drove past nearby Serabit el-Khadim where Moses is proposed to have sought refuge with Jethro, and finally stood on the summit of Mount Nebo/Nevo (in Jordan) with the intention of seeing the same view, as I assumed did Moses, of the for him never-to-be-reached promised land. I had not intended these trips to be in the footsteps of Moses but after reading von Spaeth's story I realise that I have been near to much more of his history than I thought, and am thankful and pleased for having been given this additional insight and new perspective. The book starts with a review of Egyptian history, and a reminder that Moses' existence as a historical character is not universally accepted (and especially disputed, it seems, in Denmark. The scene is set in the 18th Dynasty when during the times of Queen Hatshepsut (1509-1487 BC) (known as "The Pharaoh's Daughter" as a crown princess is called in Egyptian texts), a rare celestial conjunction at new moon, recorded in old Jewish sources (and shown by modern astronomical calculations to probably have been the one that occurred at new moon between February-March 1537 BC) together with mention of a prophecy that in three years a royal son will be born who will change the course of Egyptian history. This places Moses' birth in 1534 BC, predating a contemporary concept of the age of the Biblical version by 200 years. The biblical story of the finding of the three-month old boy child is shown to be identical to a ritual played out in Egypt to separate the celestial birth of a crown prince from his biological birth from a human mother, common to similar rituals in many places in the ancient world including Denmark. In this case the biological mother and the royal stepmother are argued plausibly to be the same person, and the scenario around the ceremonial discovery of the child in an ark made as a woven basket is part of the theatre of a mystery/passion-play with the real actors representing at the same time their celestial equivalents. Hatshepsut is playing Isis, mother to Horus, of whom Moses is the embodiment and receives this child of heaven well knowing that it is her own and her appearance on the banks of the Nile at the right moment just follows stage directions: Jethro is playing the Nile-god Jitru (Jtrw/It(e)ru) (the Egyptian word for Nile or river), who delivers the child whose father is identified with the god Amon-Ra. Shakespeare got it partly right: life is but a stage, but these actors live on. What makes this and the rest of the tale believable is the extent to which von Spaeth has been able to assimilate a vast amount of information from a wide variety of sources, utilising research into Hebrew, Egyptian and other contemporary language documents. With this knowledge he then reconciles the relationships between the Egyptian proper names and titles of these wonderful characters, and their Hebrew equivalents in the many records of the Old Testament and the writings and transcriptions of Hebrew rabbis and scholars during the past 3500 years. Especially intriguing, and convincing, is von Spaeth's ability to find, combine and sort out the content of the many Egyptian puns and word plays in which they seem to have enjoyed indulging. To name several of the arguments presented, the common understanding of the Hebrew name for the biological mother of Moses is Jochebed and his father's name Amram. Jochebed is Egyptian with roots in Jah(w) (moon) and Kebet (Qebhut, Qebhit) (heaven), names identified with Isis and used when referring to Hatshepsut. 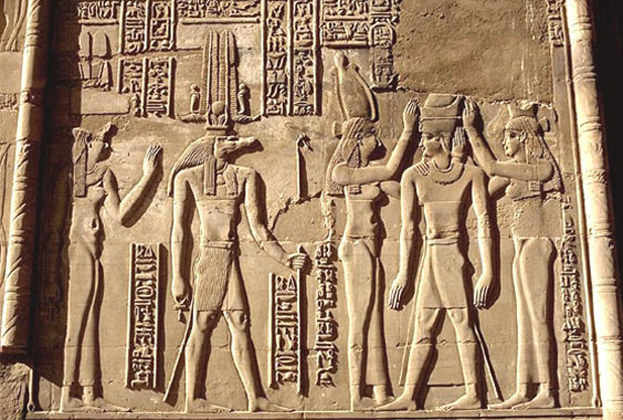 Amram is related to an attempt at the Hebrewification of Amon-Ra(-Re) (Egyptian's highest god). Since vowels(-markers) were only added to Hebrew texts around the 6-10th century AD, it is easy to understand why interpretation and correspondences with earlier Egyptian writing and oral history has often gone awry and the entire field of nomenclature is difficult and full of potential pitfalls and surprises. The name Moses, it turns out, is related to the Egyptian word for boy-child (mosis) and is linked to Tuth-mosis, both the name of Hatshepsut's father and also of her later consort, and most probably used to denominate her royal child as well. The subsequent divergences between Egyptian and Hebrew versions of the "legend" are explained in a long review and logical analysis of studies of the Hebrew texts of this and later times: consistent suppression of the Egyptian origins of the heroic Moses emphasises the idea of his being a Hebrew (hence the book's title and subtitle), although his personal behaviour is more suggestive of a non-Jewish background (i.e. marrying his half-sister). I must explain my need to have read the book twice. When I first took up this handsome volume, I was, in spite of the author's caveat that it was not a scientific work but an attempt at a transdisciplinary popularisation of history, convinced that I was about to read a (quasi)scientific treatise which it strongly resembles. The book contains many illustrations together with appendices on: older versions of the Moses myth; celestial conception in the time of the Pharaohs; dating of Moses and the Egyptian calendar and reigns of the Pharaohs; and a review of the astronomical calculations used in the dating and their sources. There is also a 32 page bibliography divided into 12 thematic sections and 14 subsections. As I started to read I was conscious that von Spaeth is preaching to the converted so that his repetitions, whether pedantic or for emphasis, are somewhat misplaced. Furthermore, the use of references in the text is frustrating: just when you want to know from where a piece of information comes (i.e. that DNA testing on mummies has revealed great inbreeding amongst Egyptians of these dynasties) there are few clues given to the source of his conclusions. And references which do appear in the text are difficult to find in the bibliography since most of the 1000 citations are of secondary sources and one must search through many of 26 separately alphabetised sections. So reading and understanding is accomplished in fits and starts: "what is the reason for this conclusion?" one frequently asks oneself, and then says, "oh well, never mind, lets just get on with it! ", proceeding to the next complex explanation of who was doing what to whom and why. The remarkable accomplishment of von Spaeth in "Assassinating Moses" is his collecting in one place all the arguments he has found in support of his story: but it is impossible even to guess what he has left out to avoid possibly negating his thesis. There is little differential diagnosis here. The reader has to take von Spaeth's word for what is written, but thereafter going from one intellectual problem and its solution to the next is a relatively easy question of faith. The last two chapters disconcert since they serve mainly as further advertisement for the next volume, whetting the readers appetite, which can grow only after deciding to forget false expectations and suspending disbelief in the facts of the story as presented, and then making him wait. Anyone with a non-specialist interest in these far-off times from a religious or historical perspective will enjoy having this volume at hand. But there is also something for almost every taste, and certainly enough grist for years of grinding of the mill of controversy amongst the many specialist historians, Egyptologists, anthropologists, and Hebrew scholars who will not be able to suspend their disbelief in the story as I have. I must also admit that I had found the plot so believable that I grew to expect quoted dialog between some of the characters (Just what did Jethro and Moses talk about in their hideaway in the desert? ), but I guess I will have to wait to see the movie, the screenplay of which is certain to be made from these tales. I look forward to the next four volumes of this exciting story now that I know how to sit back and enjoy them: I also think I'll read Exodus again to refresh my memory of the biblical version. But I do hope that von Spaeth's publisher will provide him with the services of a good and patient editor. The series also deserves an English translation so that it can be appreciated and argued about by a broad international audience. R.M.S. Copenhagen, 15 October, 1999.